Heather Harvey is currently a Studio Art Student at Capilano College in Vancouver, Canada. She enjoys all forms of artwork including painting, drawing, sculpture, ceramics, and computer graphics. She has done portraits of both people and pets, as well as selling assorted paintings, drawings, and murals. Heather has no definite plans for the future, besides completing the Studio Art Program, but she would like to like to involve art in any future career. She also dabbles in creative writing and web page design. Fantasy, and dragons in particular, have always fascinated her and have become one of her favorite subjects. When Heather is not involved in an art project of some type, she loves to spend time with family or friends. She is also an avid reader with a passion for cats, including her current feline Gryphon. 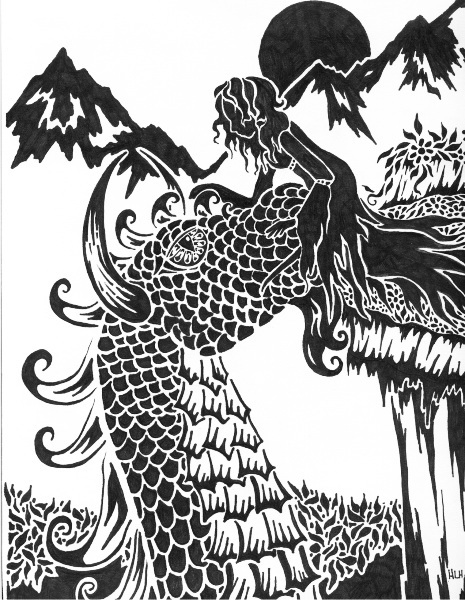 "Dragon Visiting Lady on Cliff" copyright © 2002 by Heather Lee Harvey.